The Big 5 are Africa’s undisputed super stars and the reason tourists set out eagerly on dawn and dusk game-viewing excursions. There can be no argument that giraffe and zebra are prettier creatures than buffalo, or that cheetah can be easier to find than leopard, but seeing any of the Big 5 living wild and free in their natural habitats remains an unforgettable thrill at the top of most travellers’ safari tick list. The term ‘Big 5’ was originally coined in the 19 Century by big game hunters who listed African elephant, Cape buffalo, African lion, leopard and rhinoceros as the five most dangerous creatures to hunt on foot in Africa. Fortunately, the Big 5 are now protected in national parks and private game reserves, and the term is synonymous with photographic safaris. Today’s tourists contribute directly to the conservation of these magnificent animals across encroachments like poaching, wildlife trafficking and habitat destruction. 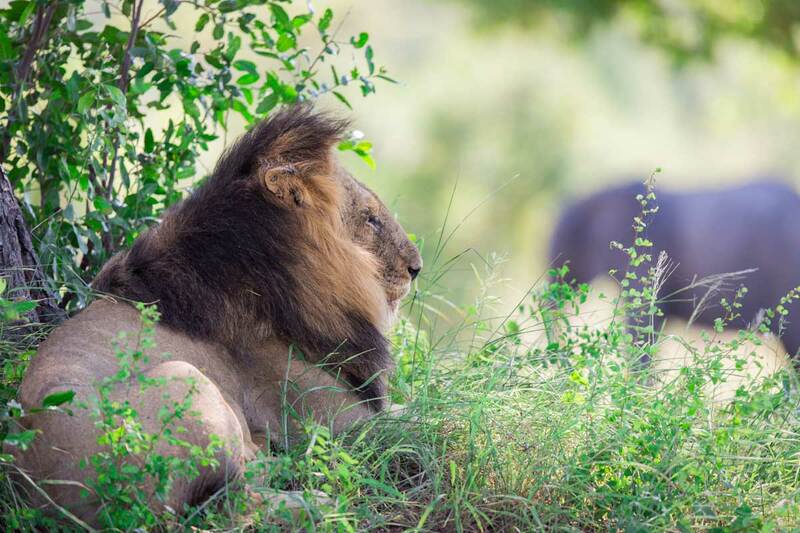 When is the best time to see the Big 5? The lack of rain means the vegetation dries up and thins out, literally making it easier to see a rhino or buffalo compared to the long, dense grass and heavy foliage of summer. 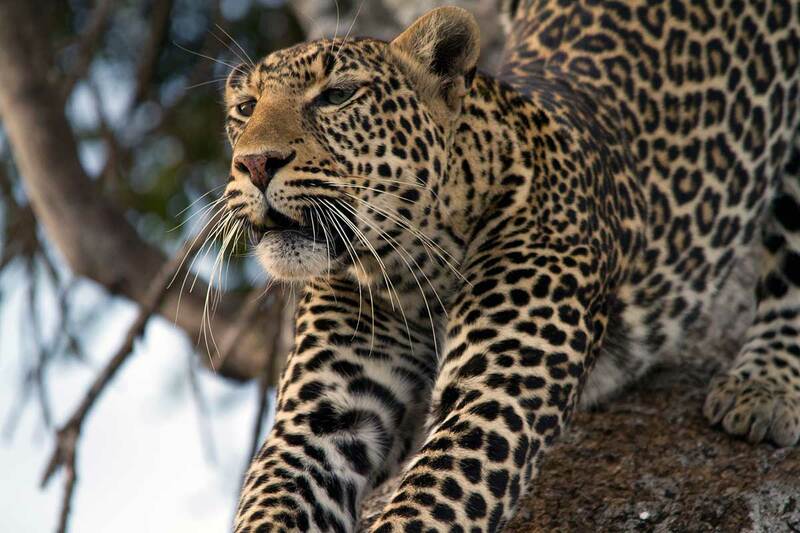 This particularly applies to leopards, which spend much of their time in trees – in winter, they will have fewer leaves, making these sleek felines easier to spot. The lack of rain also means that ponds, streams, puddles and smaller water courses dry up, forcing animals to congregate around the remaining large lakes and rivers. Most animals must drink every day so they don’t stray too far from the little water that is left. This is particularly true of herds of buffalo and elephant, which often migrate to lile-giving rivers like the Chobe at the border of Namibia and Botswana. Where are the Big 5 found? The Ngorongoro Crater This crater in Tanzania is packed with about 30 000 animals that can’t descend the steep walls and so thrive in this varied ecosystem. It is easily combined with the Serengeti and Tarangire. 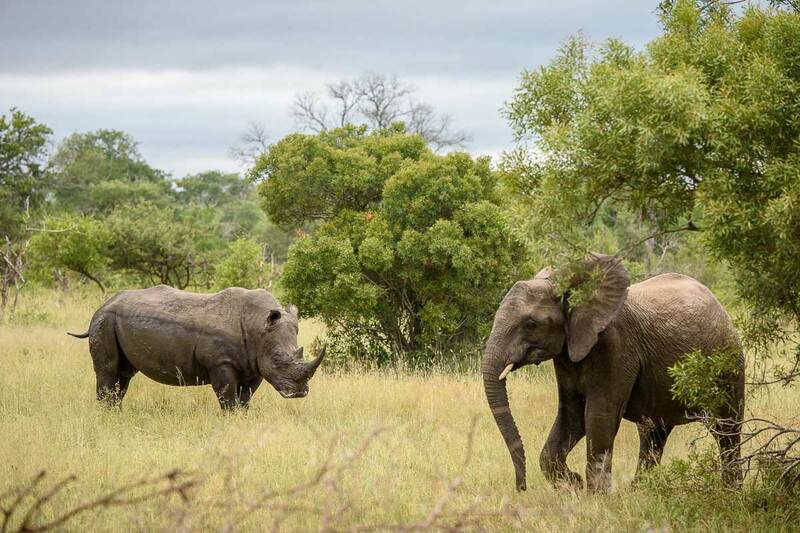 Madikwe Private Game Reserve Former farmland in South Africa that is being painstakingly rehabilitated, Madikwe has all the Big 5 as well as luxury lodges and co-operation between different guides. It pairs with Sun City, Africa’s largest resort. The Kruger National Park A staple on any safari-goer’s map, whether you’re a beginner or a seasoned traveller to Africa. This massive chunk of South Africa – the size of about Israel or Belgium – is a good place to start. Sabi Sand Game Reserve Sharing an unfenced border with Kruger, the beauty of Sabi Sands is that only guests are allowed in while animals can wander at will. Some of Africa’s most luxurious lodges are found here. 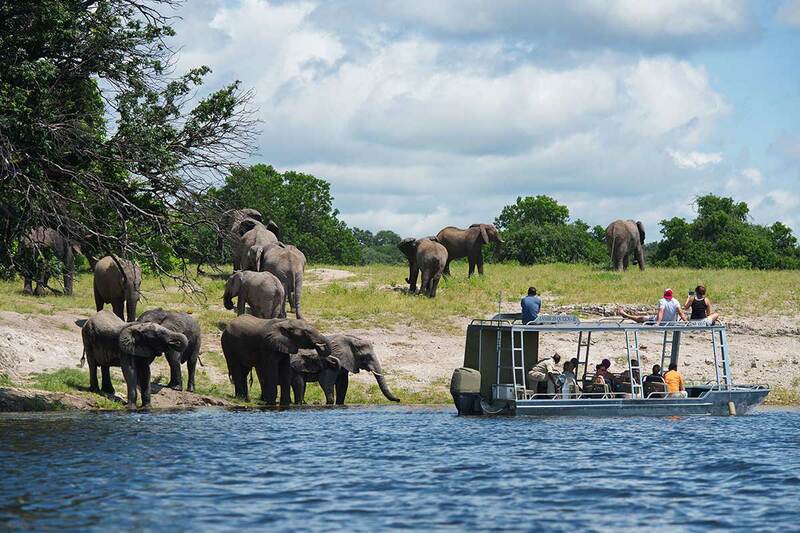 The classic way to watch elephants at Chobe is by boat. This gives you great sightings of them swimming, wallowing and spraying themselves with water. Male African elephants are the world’s largest terrestrial animal reaching heights of four metres / 13 feet and weighing up to 7 000kg / 15 000lb. Their incisors grow into tusks, which they use to move objects, dig and as weapons, while their famously large ears help control their body temperature. Related females live in family groups with their calves, while mature males live alone or in bachelor herds. Elephants are gregarious with multiple family groups socializing together. How to get the shot Use a wide-angle lens to contextualize them in the natural landscape. Choose a zoom lens to capture intimate physical characteristics, like their tusks, trunks or wonderfully expressive eyes. Emphasize their size by shooting from different angles, for example from ground level if you can get into a hide. 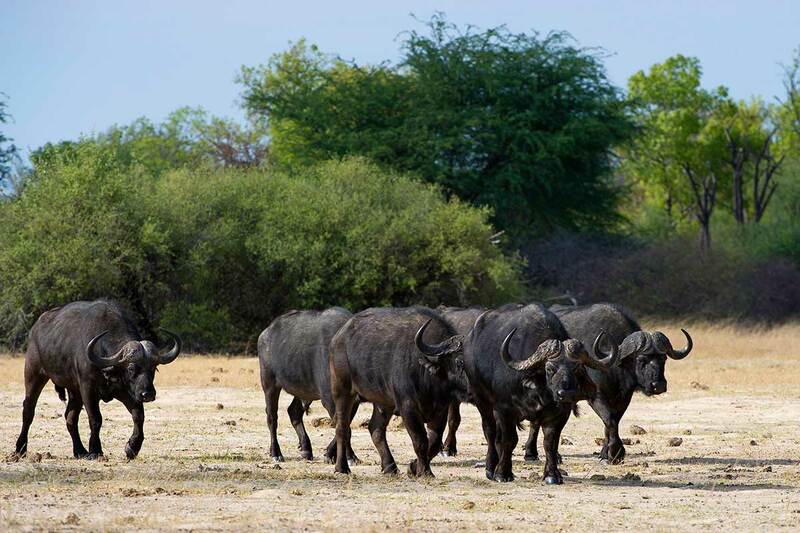 Buffies on the move can be a formidable sight – this determined herd was spotted in Hwange. The African or Cape buffalo is a large, horned bovine found in South and East Africa. Both males and females have horns that form a continuous bone shield across the top of their skulls. Buffalo are very unpredictable and quite fearless, which explains why buffalo have never been domesticated. They are not the ancestors of domestic cattle and are only distantly related to other bovines, like the Asian water buffalo. Only lions have the group strength to hunt buffalos and these bovines are no easy meal – they are quite capable of defending themselves and will gore predators to protect their herd mates. A herd of buffalo can easily intimidate a pride of lions and there is footage of a resolute buffalo putting its head down and simply ‘walking off’ attacking juvenile lions. How to get the shot Buffalo are tricky to photograph because the darkness of their hides is a constant challenge to your exposure. However, a backlit herd on the move with dust clouds kicked up around them offers one of the most atmospheric scenes to photograph. Lone bulls offer great character studies too with their huge horns and inscrutable expressions. Bulls love to wallow in mud, which makes for superbly textured black and white images. Look out too for small birds known as oxpeckers that nibble ticks and fleas out their ears, which can make for interesting images as the delicacy of the birds contrasts with the looming bulk of the buffalo. 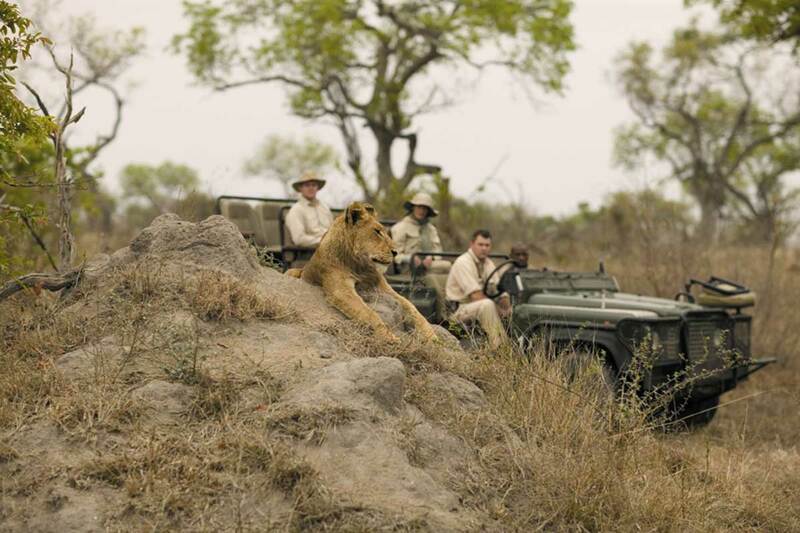 An exclusive sighting in the Sabi Sands as this lion surveys his territory from atop a rocky outcrop. About 10 000 years ago, lions were among the most widespread large land mammals after humans. Today, they are a vulnerable species with most of the world’s wild lions living in sub-Saharan Africa. Lions are unusually social compared to other cats - a pride consists of related females, their cubs and a handful of adult males. Prides spend their days dozing in comfort and hunt in the dark hours between dusk and dawn. Females typically hunt together and are considered apex predators. How to get the shot Capturing an extraordinary lion image depends as much on your patience as on your ability to observe them when they are resting during the day, preparing to hunt at dusk or on a kill at dawn. Only private reserves and concessions offer night drives, which offer the chance to capture a pride in a playful mood before hunting or after feeding. If you are lucky enough to witness lions feeding, don’t forget to shoot some wides of the action happening around a kill, like incoming vultures, sniffing hyenas or skulking jackals. Cubs are wonderful subjects and often more active during the day than adults. A tight zoom makes the most of all their adorable features, from oversized paws and ears to kitten-like growls. Leopards are smaller and lighter than jaguars with similar rosettes on their fur and, like jaguars, melanistic leopards are called black panthers. Leopards are solitary creatures that make excellent use of camouflage and are strong enough to drag their prey up into trees, away from rival predators and scavengers. Leopards are one of the fastest big cats, able to reach speeds up to 58km / 36mi per hour. Leopards are masters of camouflage, naturally shy and nocturnal, which is why they are so hard to find and observe in the wild. If this is the creature you most want to see, definitely let your consultant know so that your game viewing takes place in reserves where leopard sightings are regular and the population of these cats is healthy and stable. How to get the shot Triple check your settings and review your images between shots to make sure your exposure is good when shooting leopard. If your leopard is in a tree with a bright sky background, use your camera’s spot meter function to get the best possible reading of the light where the leopard is - not the sky - then either manually plug in the values or use your Auto Exposure lock function to prevent your leopard from being underexposed. In low light, bump up your ISO and set your aperture at its widest - your depth of field will be very shallow, so take a moment to think about the focal point in the image you’re composing. Some of the most evocative leopard images make a focal point of their wonderfully enigmatic eyes. 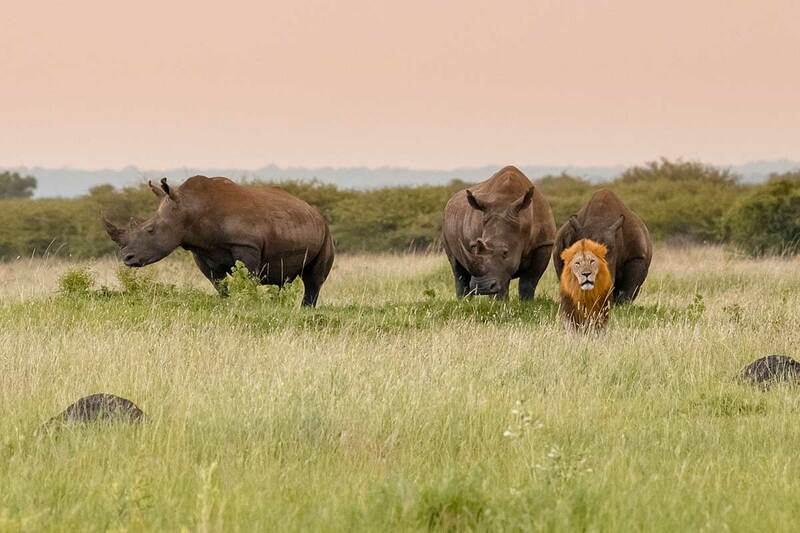 A lucky shot in Phinda: adult rhinos aren’t bothered by a single lion as their horns could easily gore him to death. Rhinos range in colour from pale grey to medium brown – it’s not their colour but the shape of their upper lip that determines which sub-species is which. ‘Black’ rhinos have a hooked, pointed upper lip while ‘white’ rhinos have a broad, square upper lip. The species is classified as critically endangered: rhinos are killed to supply the demand for their horns in Asia. A rhino horn is made of keratin – the same substance as our hair and nails – which means it will re-grow if cut. However, the illegal trade values the base of the horn under the skin, the harvesting of which results in such severe wounds that rhinos that might have survived the initial assault invariably die of shock and blood loss when their horns are removed by chainsaw or machete. How to get the shot Like elephants, the sheer massive bulk of rhinos make for a rich variety of composition options. A wide angle delivers context while a zoom allows you to focus on the fascinating aspects of their prehistoric-looking bodies. Their ears and eyes are particularly expressive and the bouncing antics of young calves more than makes up for the fairly sedentary habits of the adults. Rhinos lend themselves to compelling compositions featuring a lone individual in a wide-open landscape as well as hopeful images of youngsters whose horns have yet to grow. If you’d like to help the rhino survive, we support Rhinos Without Borders because we believe their approach has the best chance of success. You can help them move rhinos from poaching hotspots in South Africa to safety and security in Botswana, a mammoth operation involving helicopters, vets, trucks and special bomas. The good news is, babies have already been born to mothers in the Rhinos Without Borders programme!